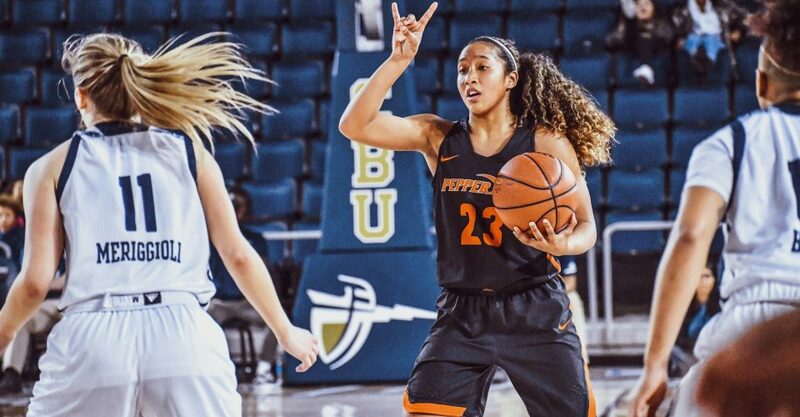 Pepperdine Women’s Basketball made program history by winning its first and second postseason games ever Wednesday, March 20 and Sunday, March 24. The Waves defeated California Baptist 91-79 in the first round and Saint Mary’s 65-61 in the second round of the Women’s National Invitation Tournament (WNIT), both on the road. The WNIT committee selected the Waves for the tournament for the first time since 2011, as the team reached the 20-win mark this season for the first time since 2010. The Waves, sent to Riverside to take on the Lancers, responded by getting the program’s first postseason win since the Association for Intercollegiate Athletics for Women era in the 1970s. Senior Yasmine Robinson-Bacote led the team with 31 points and 15 rebounds, while junior Barbara Sitanggan added 14 points. Sitanggan broke the Pepperdine season record for “made free throws” in the process, going 10 of 11 from the line. In a back-and-forth game, the Waves trailed 41-37 going into halftime before taking a four-point lead entering the fourth quarter and holding off the Lancers the rest of the way. Second-year Head Coach Delisha Milton-Jones and the team then traveled to take on Saint Mary’s, a team with which the Waves split the regular season West Coast Conference series. Again, the Waves were behind at halftime, shooting only 33 percent in the first half and trailing 41-27. However, the team battled back, outscoring the Gaels 26-14 in the fourth quarter with clutch performances by Robinson-Bacote and junior Deezha Battle. Despite a cold-shooting first half, Robinson-Bacote finished with 31 points once again. Now, the Waves will take the “road warriors” role to Laramie, Wyoming, as their third-round game is Thursday evening against the Wyoming Cowgirls. The WNIT does not seed teams, but selects home sites as the tournament goes on, so the Waves could possibly host a game at Firestone Fieldhouse should they continue winning.